The United States might not lose its seat on the Green Climate Fund it has abandoned under President Trump. 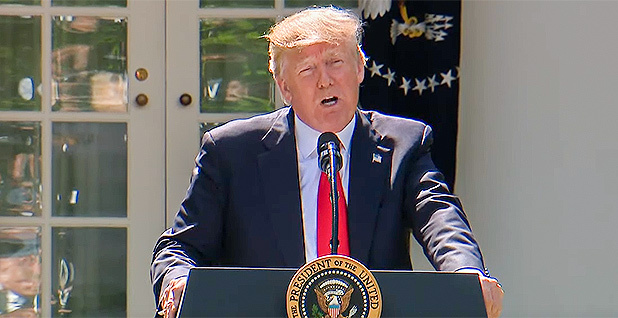 Trump two weeks ago in the White House Rose Garden denounced the U.N.-led fund to help poor countries cope with climate change as a multibillion-dollar boondoggle. It was a prime reason for declaring the United States will withdraw from the landmark 2015 Paris Agreement. "Under the Paris accord, billions of dollars that ought to be invested right here in America will be sent to the very countries that have taken our factories and our jobs away from us," Trump said. "So think of that." In fact, the Obama administration pledged to provide a total of $3 billion by 2020 to the fund, which predates the Paris deal and is separate from it. Continued participation in Paris wouldn't have compelled the United States to provide anything, and Trump has made it clear that no further funds will be provided to the GCF. But Trump's withdrawal doesn't mean the United States is automatically dropped from the 24-member board of developed and developing countries that will determine how the $10.3 billion fund operates or what projects get its funds. In fact, President Obama's provision of $1 billion toward the $3 billion pledge, which Republicans denounced, would ensure the United States can maintain its seat for the next two to three years. The Trump White House and State Department have not said yet whether it will keep the seat. A State Department official told E&E News that "future U.S. engagement with the GCF will be decided as part of the wider internal process to further develop our policy on climate change." But at least a few conservatives think the United States should, if only to ensure those funds are spent "responsibly." "I think the main question facing the administration right now is what do we do with the seat," said Chrissy Harbin of Americans for Prosperity. "It seems to me that it would be a pretty bad deal to dump a billion dollars into the Green Climate Fund and then pull our seat away and not get anything for it." Harbin, an opponent of the Paris deal, said the GCF could make some of the same mistakes she believes the U.S. government has made in supporting clean energy domestically — only with less oversight and accountability. A U.S. "seat at the table" could help with transparency on wind, solar and other projects built overseas, she said. Supporters of climate finance say the GCF board would indeed be unlikely to expel the United States over the next few years based solely on Trump's decision to stop providing aid. The board reserves 12 seats each for developed and developing countries, with the world's top six donors to the GCF assured half of the developed world's share. Obama's $1 billion provision means the United States will be the fifth-largest contributor to the GCF even if other developed countries make good on their full pledges to the fund. Nine developing countries have voluntarily pledged funds to the GCF. And China holds one of the developed country seats despite not providing any donations to the GCF, though it is providing more than $3 billion in climate aid to poor countries outside the U.N. fund. But the U.S. seat is not permanent. When it comes time for donor countries to offer new pledges to the fund because 60 percent of the initial funds are pledged to projects, the United States will lose its seat at the table if it doesn't make a fresh pledge. That will happen in the next two to three years. It is unclear whether the United States will retain its current seat after it expires next December or whether it might continue to have the seat until this next "replenishment." And while the United States may keep its seat, it's not likely to keep its clout with other board members after Trump disappointed foreign allies by withdrawing from Paris and reneging on the GCF pledge. "The problem won't be that other countries will be asking the U.S. to leave the room," said Leonardo Martinez-Diaz, a top Treasury Department official under Obama and director of sustainable finance at the World Resources Institute. Defaulting on the aid pledge "will limit its capacity to continue to guide the future of the fund, and strategy and policies." "It will be hard to be taken seriously by others if you're just there opining on issues but you no longer support the fund financially," he said. "And that matters a lot in an institution that's consensus-based." It will be particularly difficult for what Martinez-Diaz called a "deadbeat" board member to sway the other 23 board members to consider projects and policies that are outside the scope of what the vast majority of the board supports. For example, in the run-up to Trump's decision to leave the Paris accord, some coal companies raised the prospect of the United States using its GCF seat to fight for funding for lower-carbon coal projects abroad, potentially including carbon-capture utilization and storage. While the technology is not barred in the language that established the GCF, it doesn't have broad support in other countries, many of which view the proliferation of coal-fired power under any circumstances as detrimental to climate goals. Karen Orenstein, who handles international climate finance issues at Friends of the Earth, said that Trump's political team could "muck up" GCF policy by trying to use its seat to further fossil fuels interests. If it instructs the State Department career staff members who represent the United States at GCF board meetings to "carry out his inhumane, fossil-fuel-propagating agenda, then it would be better if the U.S. sent no one," she said. "While that has not been the M.O. of previous U.S. GCF teams, given Trump's recent verbal virulence, it is currently difficult to be very optimistic about U.S. engagement," she said. A meeting of the GCF board was expected early next month but has not yet been announced. Larry McDonald of the Treasury Department's foreign affairs department represented the United States at the meeting last April in Seoul, South Korea.